As Avingard entered the fort he quickly noticed a large nord bandit standing near a fire. The bandit was so deep in thought that he didn’t even hear Avingard enter the room. After closing the door slowly, Avingard readied his sword, and with one quick movement bashed his sword down across the skull of the bandit. As the bandit fell to the ground with a thumb, he knocked over a few pots that were on a ledge above the fire. The loud racket of the pots hitting the floor alerted other bandits in an adjacent room on the second floor. Suddenly, Avingard heard heavy footsteps above him quickly move closer to nearby stairs and then climb own those stairs. Unsure of what to expect, Avingard moved into the middle of the room to give himself enough room to maneuver. Just then a large orc bandit entered the room brandishing a large axe. After spotting Avingard he charged, drawing his axe above his head. Avingard retaliated with a similar behavor, drawing his large sword above his head. Avingard and a bandit in combat. The two large weapons came down with a loud clang as both connected in mid-air, sending both combatants backwards against opposing walls. By then, a third bandit, much more heavily armored had entered the room. With the orc bandit struggling to get to his feet after the last attack, the third bandit charged while grabbing a large warhammer in both hands. The bandit swung the large hammer, barely missing Avingard who had just dodged out of the way. A second swing connected with Avingards back, causing great pain as well as driving him forward into a wall. Not letting up, the bandit pressed the attack with the warhammer, but Avingard had enough sense to continue moving, causing the warhammer to hit hard into the wall. By this time the orc bandit managed to get to his feet to try and resume his attack. 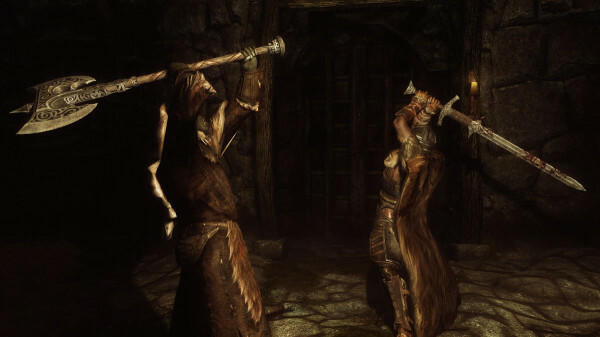 While he lifted his large axe for an attack, the crash into the wall caused him a great deal of dizziness so he had trouble starting any offense. Avingard had finally risen to his feet, as well, and see the stumbling orc decided to use the orc to his advantage. While the orc attempted to swing his axe at Avingard, missing completely, the third bandit lifted his warhammer attempting a similar move. Avingard quickly got behind the orc and shoved him towards the third bandit, causing the warhammer to come crashing down onto the head of the orc. The impact killed the orc bandit. The third bandit became furious at Avingard’s pushing, and upon removing the warhammer from the skill of the orc charge at Avingard. This time, however, Avingard was ready and swung his sword at the bandit, causing the bandit to lose his grip, with one hand, on warhammer. Unable to quickly counterattack, and needing to adjust his stance, the bandit lurched backwards only to be connected with Avingards swing into his side. Reeling in pain, the bandit released his warhammer and dropped to his knees. Avingard then finished off the bandit by smashing his sword down onto the bandit’s head. After killing the three bandits, Avingard fell backwards against the nearest wall, exhausted from the battle. His back was in pain, as well as his arm, from all he combat. Looking through his inventory he pulled out another healing potion and quickly quaffed it down. His wounds stopped healing but he remained down for a few minutes to regain his breath. Once he felt better he rose to his feet to continue exploring the inside of the fort. He climbed up the stairs to the second level to look around. He was sure there were no other bandits inside so he quickly looked around. The stairs led to a small storage room, and that room opened up to a larger room with beds and tables. Looking around, Avingard found a few things of interest, and once he was sure there was nothing else, he went back down the stairs and out the door into the courtyard of the fort. After the battle with the bandits within the fort, Avingard was now as determined as ever to clear out any remaining bandits. Looking around he noticed another door to the fort off to his left. He made his way over to the door and then slowly opened it, hoping to take any bandit by surprise. The room he entered smelled like rotting carcasses, and the air was damp. Like most fort interiors, this one was also dark with the exception of a few areas lit by candles. Immediately after entering the room, a large orc bandit came charging at Avingard, who with a quick slash of his sword sent the bandit dead to the ground. Avingard felt pretty good about making such quick work with the bandit. His moment of triumph was short-lived, however, as a second bandit came running up some steps to Avingard’s right. The bandit ran at Avingard, yelling as she went, but Avingard quickly disappeared into the corner, and into the shadows. The bandit quickly looked around for the intruder, and was met with a large greatsword across her neck. Two more bandits were now lying dead on the floor. Avingard quickly searched their bodies and taking anything that may be valuable. As he searched the bandits, he heard a third one call out from below the steps. Avingard didn’t make a sound, but instead readied his sword and slowly descended the steps towards the noise. Avingard could he the slow footsteps of the bandit moving towards a doorway off to the right, so he decided to stop. Just at the bandit passed through the doorway – giving Avingard a clear shot – Avingard let loose his greatsword on the bandit’s skull, sending the bandit hard to the floor. Once he was sure the third bandit was dead, Avingard peered through the doorway and down a short hallway with prison cells along the sides of the hall. He must have entered the fort’s prison. After realizing that all bandits were now dead, Avingard looked around for anything of value, and noticed a chest. He opened the chest and took a few valuables and then quickly left the prison and stood outside the fort’s courtyard. His task of clearing out the bandit’s from Fort Hraggstad was now complete, so Avingard made is way back to Solitude and hoping he can complete his first main task – joining the Imperial Legion.